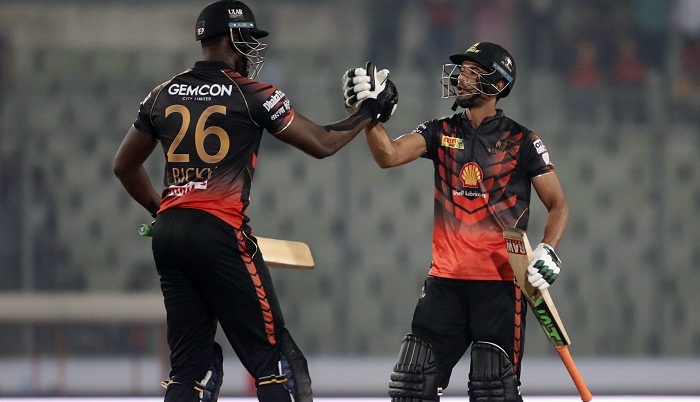 Khulna Titans ran down a 161-run target with 10 balls to spare to rise to second position in the 2017-18 Bangladesh Premier League, beating Chittagong Vikings by five wickets on Friday at Shere Bangla National Stadium, Mirpur, Dhaka. It was the fourth defeat in six matches for Chittagong, who are quickly slipping out of the reckoning for a spot in the knockouts. Titans’ skipper Mahmudullah and Ariful Haque duo played a vital role to take their side at the shore of the victory. Both batsmen added 70 runs for the fifth wicket. Ariful, who made 34 off 24 balls, fell with 12 runs required, but Carlos Brathwaite blew a four and a six to level the scores. Mahmudullah then scorched a four through cow corner to hit the winning runs and stay unbeaten on 48 off 35 balls. Earlier, Rilee Rossouw razed Chittagong in the early parts of the chase, hammering 49 off 26 balls. Rossouw was part of a middle-overs slide that saw Khulna lose three wickets for 25 runs. In Chittagong innings, Anamul Haque scored highest run for Chittagong with 62 after they were invited to bat. Like Khulna, Chittagong lost ground, moving from 101 for 1 to 107 for 4. Stiaan van Zyl and Najibullah Zadran then shared a 50-run stand for the fifth wicket to lift Chittagong to 160 for 5 in 20 overs. Zadran made 24 off 16 balls, while van Zyl was unbeaten on a 15-ball 23. Abu Jayed was Khulna's most impressive bowler, finishing with 3 for 26, although he very well could have had five. In a shoddy fielding performance, Khulna dropped six catches, Mahmudullah, the captain, culpable of four of those lapses. Anamul Haque's lack of batting opportunities in the tournament ended when he walked out at No. 3 with 19 overs left in the innings. He started out by offsetting the early loss of his captain Luke Ronchi with a 95-run second-wicket stand with Soumya Sarkar. In the process, Anamul raised his first fifty in T20 cricket since November last year. His brace of pulled sixes against Shafiul Islam and a straight one off Carlos Brathwaite especially stood out. Three overs after reaching his fifty, Anamul nicked off to the wicketkeeper, finishing with 62 off 47 balls. His innings was a study in contrast to that of his partner Sarkar, who clawed to 32 off 34 balls, and survived a number of chances before being caught at long-on. Khulna's horrid day on the field began in the first ball of the match, when Rossouw spilt a tough offering from Ronchi. Fortunately for Khulna, the Chittagong captain got out later that same over when he skied a catch to Mahmudullah at mid-on. Then, in the 11th over, Mahmudullah let Sarkar's reverse-sweep burst right through his fingers at square-leg. Sarkar survived two more chances in the 13th over. Ariful Haque put down an extremely tough chance after being slightly late to get around the ball. Sarkar persisted with the reverse sweep and sent one straight to Mahmudullah three deliveries later only for the captain to shell it again. More lapses followed in the slog overs. Jayed had two chances go down off his bowling in the 18th over. First, Michael Klinger dropped Najibullah Zadran at extra cover, before Mahmudullah couldn't close his fingers on Stiaan van Zyl's uppish shot at mid-on despite timing his jump well. Playing their first match, van Zyl and Zadran created an immediate impact with their big hits. They struck two sixes each in the last four overs, Zadran clearing the cover and long-off boundaries while van Zyl went comfortably over midwicket and long-off. It meant Chittagong managed a decent recovery, collecting 44 runs in their last four overs. The first six of the chase took just two balls coming, Rossouw blasting Sikandar Raza over long-on. Khulna started the chase requiring a little more than eight an over, but Rossouw slashed it down to under 7.5 in just four overs. Rossouw was relentless in his assault, regardless of reprieves and wickets at the other end. Michael Klinger fell in the second over, playing against the turn of Sunzamul Islam's left-arm spin, but Rossouw responded with a brace of fours against Taskin Ahmed in the next over. Ronchi missed a stumping chance when Rossouw, on 30, charged down to Islam; Rossouw's response was a swept four through square leg and a straight six over the bowler's head. It took an arm ball from Al-Amin to end his charge, as it skidded on to beat the inside edge and clatter the stumps. When Nazmul Hossain Shanto fell halfway through the 10th over, beautifully caught by Tanbir Hayder off his own bowling, Khulna were wobbling at 79 for 4. Mahmudullah, however, had just settled in nicely, having crunched a straight six in the previous over, sent down by Al-Amin. With Ariful supporting him ably, Mahmudullah rebuilt Khulna's innings quickly. Apart from finding timely boundaries, the duo ran the singles hard and kept the score ticking, a rare sight for a Bangladesh pair. With 44 needed off the last five overs, Ariful hit Hayder for back-to-back sixes to bring the equation down to just over a run a ball. That ended up being the turning point as the balance never tilted thereafter. Ariful followed it up by slogging Jordan over midwicket to bring the equation down to 18 off the final three, before Brathwaite hastened their march towards the finish line.